The Designer Wanted A Mural Of The Entrance Gate House On The Wall. 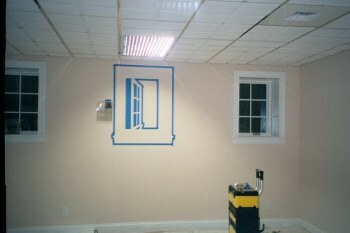 We Decided To Paint It Within A Window Frame, Matching The Existing Windows In The Room. 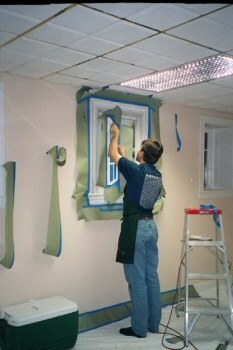 First We Draw The Window Frame And Paint It White, To Match The Trim. 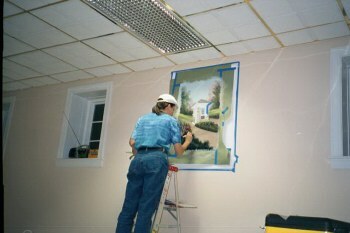 Then We Tape Up All The Trim And Paint The Landscape With The Gate House. 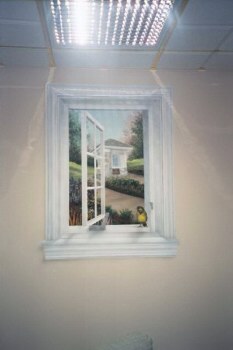 After The Window Scene Is Finished, We Cover Up The Scene And Paint The Trim, Using An Airbrush For All The Shadows And Highlights On The Woodwork. We Added A Bird After The Window Was Complete.